I have had a lot people ask me questions about sleep training. We decided to “create” our own method of sleep training. Which basically means we read a lot, got advice from a lot of parents, and combined them all together with what works best for our family. Here is what we have decided to do. We start “sleep training” around the age of 6 weeks. And this is how we start, we simply observe by writing down what our babies pattern for being asleep and awake is already. It is amazing how they have already established sleep patterns on their own, and as we record them we can start to see them appear. I usually keep a master list on our kitchen table and just jot a note down. The information I find important to write is when they eat, sleep, and are awake. When first starting our “sleep training” we aim for 1 hour of awake time (but could vary depending on the patterns we observed prior). After 1 hour of awake time, we enter into the sleep portion of the time. We swaddle them up, (using the tradition swaddle or the batwing swaddle which we use quickly since our babies are HUGE). We snuggle for a quick moment, but making sure when we lay them down they are not in a deep sleep. It is totally ok with us if they are just shutting their eyes a little and we lay them down. With all the kids we also have done a binky/pacifier, so we give them that when they sleep as well. The chunk of time before the “night time” goes as follows; after the are awake around 5 pm in this case, we feed them and then we PLAY and interact. This chunk of the time there is no sleeping (if we can, but we are flexible too). During the second hour keeping them awake is when it gets a little harder, we like to do baths, lotion them, jammies, sing songs, talk to them (usually not the same thing every night, we like variety). This to me is the most difficult time of “sleep training” because it really does require one parent to pay attention to the newborn the whole 2 hours. As you know we have 3 other kiddos and the dinner hour, but for us it has been TOTALLY worth it! The end result is something we only dreamed about before we were parents and now we are living it. So if you are following the eating pattern you will note it is time to feed right before bed. This is the ONLY time we try to feed and put to sleep, with the hope that when we do this the baby will learn that when I feed and lay down that means it is time for my long sleep. Onto the night time, so from 7 to 7 is our ultimate goal to train to sleep through, but as we all know newborns just don’t do that from birth so it takes some attention. During 7 -7 we have the lights off, soft music, and a set up area for nursing so that the dark and quiet can continue. For us, reducing distraction helps so much when our newborns wake up to nurse during that time. When they do wake up, we get them without too much crying in the beginning, we check the time to see the length between each feeding, and we feed, and lay right back down with the binky, swaddle, and without holding for too long. Does this work 100% of the time: NO! But, if we make it the goal then slowly it does work for us. Then we start the day over again at the wake time. 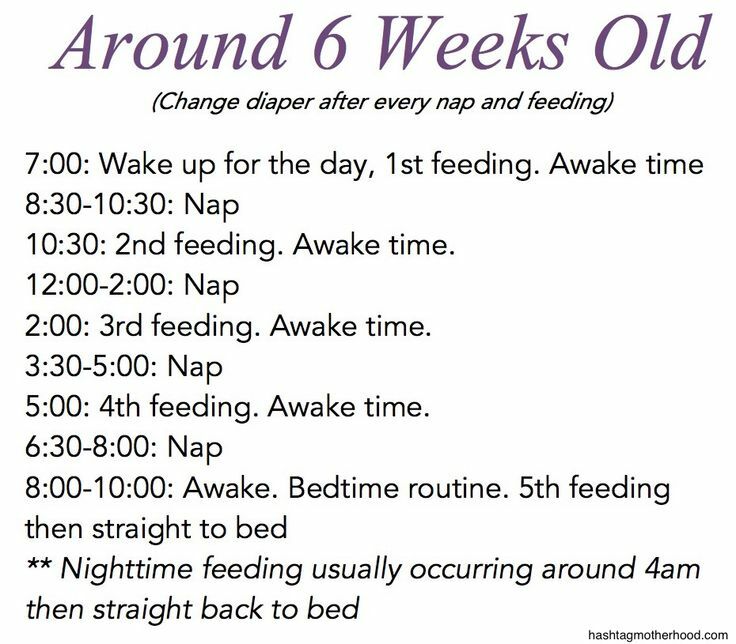 Here are some charts that help see the pattern we try as we increase their awake and sleep time. And as you will see there are many different patterns and charts so the goal is to pick one that works for you and your baby. I know now from having 4 babies that each one will do it a little different and that is GREAT! As you can see there are so many, I personally think when I was figuring out what worked for us, I read through a million. I would encourage anyone trying to figure out what works for them to read through some ideas and see what fits your family. The whole reason we sleep train is so that as a family we will work together. It has been so great for me to know when I will get one-on-one time with each kid based on when Jesse, our newborn, will be resting or when my older kids will be in quiet time. It allows me to know when I will have time to make food, read books or clean without a newborn interruption. (Does it work 100% of the time, NO! But it has given me so much sanity!) Other ways we work together is the kids all get the REST they NEED! From newborn to 4 years old, all the kids benefit from REST, and the right amount of rest! Life happens and when the kids don’t get the rest they need, I CAN TELL! Haha! Lastly, I have heard so many times, “how do you even have time with your husband, with 4 kids! ?” (Well, I want to say obviously we have enough time to make 4 kids happen 😉 BUT instead I explain that with sleep training, Darren and I get from 7:00 pm on together, and truly have enjoyed that so much! It is our time and we get to do so many things together, while all our kids sleep in their rooms. We have even worked out a dating system with some dear friends who also have similar bed times. Where we put our kids down for bed here at the house, they send their beautiful wife/momma over and she hangs here at the house, watching movies, reading, whatever she wants, while we get to go out to dinner (WITHOUT PAYING an arm and a leg for baby-sitting… can you say FREE!). Then we switch and another time of the month I go there and get to watch a movie or show or read. It has really worked for us! I am happy to answers questions best I can, but what it boils down to is DO WHAT WORKS BEST for your family, by molding together ideas, working as a parenting team and be commitment to trying what you decide. It is easy to give up but commit to your idea and give it a try! Last comment: EVERYTHING we do as parents, we should do in love! I heard a sweet friend talk to me about when she was sleep training they felt like they didn’t have a connection or bond with their baby and while sleep training (with the baby wise method) she and her husband felt like they were digging a deeper divide with their baby. SO PLEASE STOP if that happens, and most important in all of this is loving our babies! Does anyone dread Mondays? I always feel a bit of sadness when Sunday comes to a close because I know that Monday is when the hubby returns to work, and I just love our family time so much! My hard working husband works a “traditional” Monday through Friday job. (Well he is suppose to, but he picks up call, and weekend shifts from time-to-time.) I was finding that Mondays were feeling extra hard to me. So I decided to try to figure out what would make Mondays feel more successful to me. This is how my hubby and I came up with our SUNDAY PREP DAY. WE talked together about the things that would make us feel ready to begin the week fresh. As previously mentioned in another post, my hubby LOVES clear counters and table. It truly makes this fresh start feeling for the week ahead, verses the piles on piles feeling. We also discussed how I feel so much more on top of things if I know what is coming, whether that is in our calendar week or what we plan to do for school for the week. I love a full schedule but I HATE double booking myself! It is all too easy to forget to write something on the calendar or assume the other person knows what is going on. In addition, talking about the week ahead has built so much excitement and conversations for the kids. As we discussed more we found many things that would set us up for success but really tried to limit how many things we did for Sunday Prep Day, because it is a day of rest and refocus for us as well. The other thing that is important to us in all we do is to include our kids. Training them alongside us as we all work together, and Sunday Prep Day is no different. The current struggle with having a 4, 2, 1, and 6 week old kiddos is that everything we do seems to take a while. We know it is important so we take the time, but we decided we that we didn’t want our Sunday Prep Day to take more then 2 hours. Below is the list we are currently doing, while knowing it can and will change as we grow and adapt. I suppose life is always about adjustments and improvements, so right now this has been an improvement for our family. Spending some family time together preparing for the week makes us all feel ready and successful. After our Sunday Prep Day is complete we like to do a family activity to enjoy our time before daddy returns to work. Lately, we have enjoyed walking to the park, playing in the backyard, eating homemade yogurt popsicles (YUM), and or spending time reading some of their favorite books. It is a wonderful closure to one week and the start to the next. Would you like to know a secret: I was so worried when we got pregnant with baby number 4 that the other 3 kids wouldn’t get my attention. Come to find out, apparently everyone worries about this from time to time in families of more then 1 kid, let alone 4. So instead of worrying about this issue (which I am great at worrying), I decided to pray, seek council and of course go search pinterest ;). Let me break down how it works. We have taken each kid and have pair them with either: me (mom), dad (Darren), Nana/Papa (my parents), Grandma/Grandpa (Darren’s parents). And, every month it rotates. (See Picture Below). We have already had several “special days” with the kids and the feedback from them has been more the good. It is so fun to hear them talk about what they got to do. You may be asking yourself, “wait, how can you do a date with a 6 week old?” I thought the same thing, my dad brought up a great point when we were talking about the “special days.” He said perhaps a lot of the kids won’t remember EVERY date they have with each person, but what they will have is the pictures, the relationships, and the love from their family. I couldn’t not agree more with him. I look back at pictures when my grandparents and parents took me to the Oregon Zoo when I was a toddler, and to tell you the truth I remember NOTHING of that trip, but looking at the pictures the first thing I feel is LOVE, and the first thing I think is what a invested family I had (and still have)! Another blessing I have found with the “special days” is the relationships that are built when one of the kiddos is out on their date. The one-on-one time they get with one of their people creates lasting memories and builds on the love they have for that person. They get to talk one-on-one, they get snuggles one-on-one, they laugh, play and get one-on-one attention. These moments are just as valuable as being with the whole family, which they absolutely love as well! On a normal day of playing at home our two older kiddos (ages 4 and 2) tend to play together the majority of the time. Our third Jonah who is currently 16 months is still learning how to play the games the older are playing, BUT when one is gone on an outing the other older kiddo who remained at home join together and play beautifully. I love seeing the building of all sibling relationships!